Popular shapes have good application in the construction business as I, H, and U shaped beams or girders can be produced for structural integrity. Steel is a strong material that is highly resistant to shaping at normal temperatures but this resistance lessens considerably at higher temperatures. For that reason the billets, blooms and slabs from the steelmaking process are shaped into basic products at carefully controlled elevated temperatures. The method that is most commonly used for shaping is to heat the steel to around 1,200°C in a reheat furnace and roll the steel, squeezing it between sets of cylinders or rolls. Rolls are arranged in pairs and housed in a 'stand'. To change the shape of a material as strong as steel the rolls must exert forces measured in thousands of tones, and must also draw the steel continuously through the rolls while reducing the thickness. Two main classes of product are produced – flat products, sheets or strips of uniform thickness, and long products - lengths of a particular cross section, ranging from rectangular bars to double flange H sections. For flat products, two horizontal rolls are set one above the other in an open housing. For long products, a series of specially shaped and angled rolls (referred to as stands) are used to transform the section to the required shape. The figure shows the stand used to create open sections. 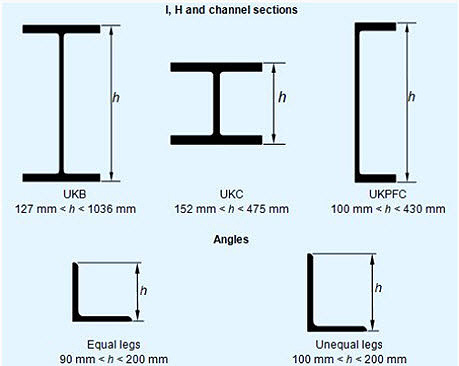 British, European and International standards define dimensions for a wide variety of open section shapes, notably I and H shaped sections, angle sections and channels. In shape rolling, the work is deformed into a contoured cross section. Products made by shape rolling include construction shapes such as I-beam, L-beam, and U-channels; rail for railroad tracks; and round and square bars and rods. The process is accomplished by passing the work through rolls that have the reverse of the desired shape. 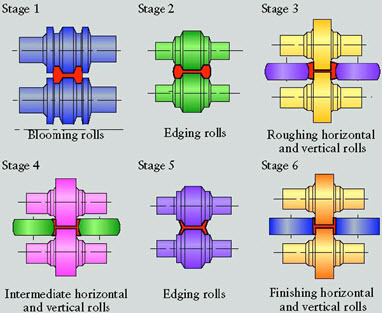 In the form of illustration, the stages in shape rolling of an H-section part can be seen in Figure 2.